This is going to trip some of you up. Australian cattle dog/blue heeler with a docked tail. But it’s red, not blue. ooh…ooh surely not that rarest of all Cattle Dog breeds, the “_Not_ an ACD”, but a “Stumpy-Tailed Cattle Dog!”. on June 18, 2010 at 12:43 pm M.R.S. Eli has it…Australian Stumpy-Tailed Cattle Dog, of the red-speckled color. And a good-looking one. Darn, I’ve got to get up earlier. They beat me to it. Heresy, I tell you! The Stumpy-Tail is not an Australian Cattle Dog is not a Queensland Heeler! Too many people have slaved their fortunes over the last vestiges of each breed, keeping the _distinct_ respective heritages alive. Its my dog. Seriously I think someone took a photo of her. Not that I mind she is beautiful. It’s either an Australian Stumpy Tail Cattle Dog or an Australian Cattle Dog with a docked tail or tail chewed off by its mom as a young pup. (or an ACD/ASTCD mix with a ‘throwback’ tail). 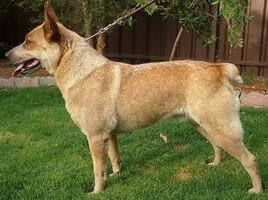 Just my two cents though, it really does look more like an Australian Cattle Dog with a docked tail than an actual Stumpy Tail breed. Stumpies are supposed to be more “square” in their build (height = length) which compensates well for the lack of rudder (aka: tail). In the US we screwed up the difference between the breeds because we thought they were the same thing and interbred them a lot. Lots of dogs born with stumps, kinked tails, short tails, and normal ACD tails. A lot of times you still get a throwback to those years where we mix bred them and get a registered ACD with a throwback tail. Not saying this dog ISN’T a registered Stumpy, just that the lack of tail doesn’t mean it necessarily is a Stumpy. This dog has a Cattle Dog ration of height to lenght, not a Stumpy “box” frame. I loved the corgi cattle dog mixed up answer – I have an ACD with a stump for a tail (or maybe he’s actually from a Stumpy line – who knows, we got hiim from a shelter) and I hear that from a lot of people.